In Adam Grants book Originals, he examines a study that can predict your job performance just by knowing what web browser you use. SAY WHAT? The study showed that if you are in customer service jobs (80% of Americans are in a service job) and you use Chrome and Firefox, you are a better performer at your job than others who use Internet Explorer or Firefox. Sounds a little insane right? Well the point of the study showed the researchers something about the poeple who picked Chrome and Firefox. Safari and Internet Explorer are the default browser on your computers, whereas Chrome and Firefox need to be downloaded. If you are the kind of person who accepts default, you might just be okay with "default" life. If you are a Chrome or a Firefox user, you probably asked yourself "there has got to be a better browser than the one installed on this computer." Are you accepting default or rejecting default? After hearing about this study, I was pretty excited I was a Chrome user. Loyal Chrome user. Like, it's hard for me to understand why people don't use chrome. But, it got me thinking. It what other areas of my life am I in Default mode? At some point in our lives we have all been put on default mode. Basically, default is going through the motions, getting by, punching the time clock, accepting mediocrity. It happens, and it probably happens more than we actually think. So, how do we get off default? Think about the areas in your life that are just OK.
Let the people closest to you know that you going through the motions. If they care about you, they will help. Plan out times for you to be productive. Be resourceful. Have you seen improvement? If not reevaluate your plan, or get out of the culture you put yourself in. 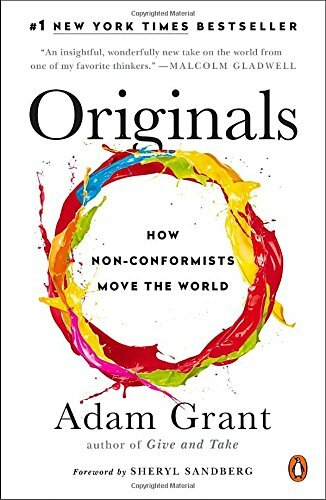 Check out Adam Grants book, Originals! You wont be able to put this one down. Get updates on podcast and blogs through your email. No spam here, I promise.